Serendipity is mobile dating application that uses location to match users. Rather than relying on profiles and common Facebook interests to creates connections between users, Serendipity pairs users who frequent the same locations. How did Serendipity come to be? I’ve always been fascinated by our adoption of new social networks and how they’ve influenced the way we communicate and build our relationships with one another. 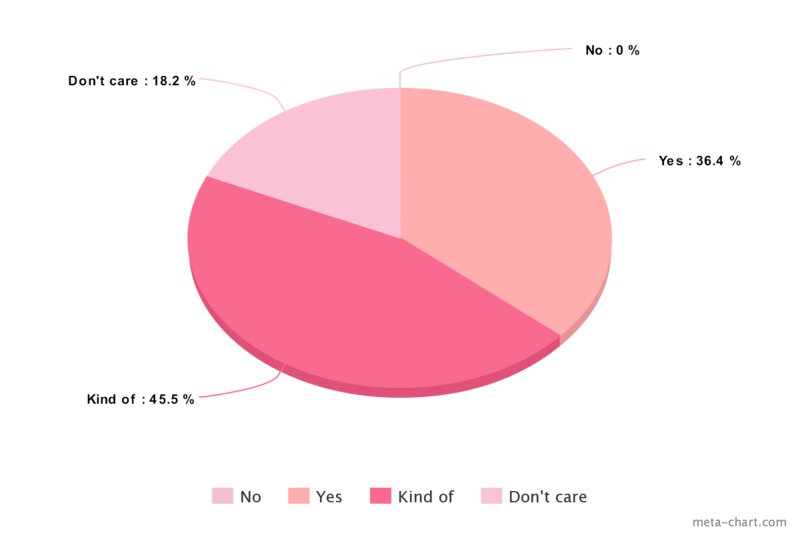 Most interesting to me has been the increasing presence and use of mobile dating apps. Although they’ve provided users with fun nights and memorable experiences, for many (including me and my friends) they’ve resulted in disappointment and frustration. 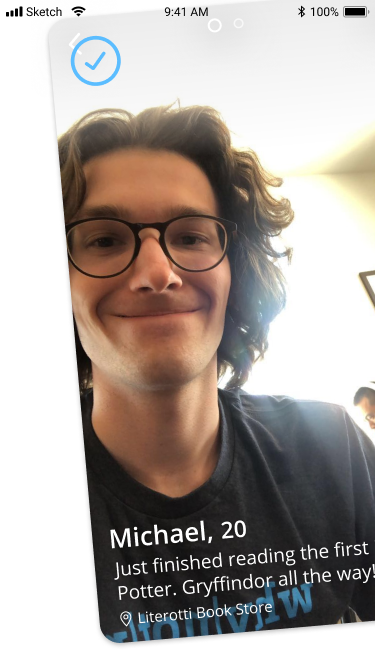 Repeatedly hearing of terrible experiences and even having a few of my own, I began to the notice ways in which dating apps could be improved. 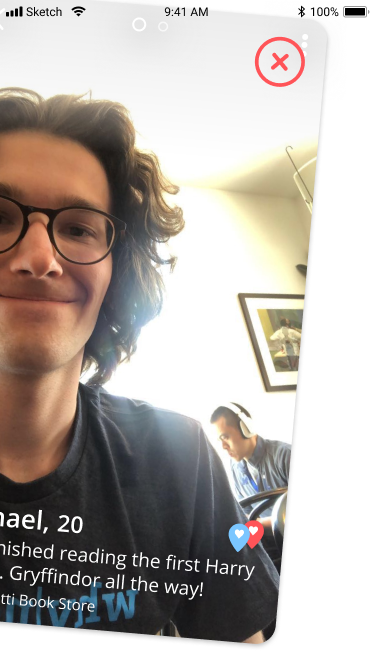 Eventually, my interest in the intersection of dating and technology materialized into a dating app service, Serendipity. What issues was Serendipity designed around? Tinder, Bumble, and almost all other mainstream dating apps link users’ Facebook accounts to their dating profiles in an attempt to match them with other users who share common interests or have mutual friends; however, the information that is taken from user’s Facebook accounts and put into their dating profile isn’t always up-to-date. 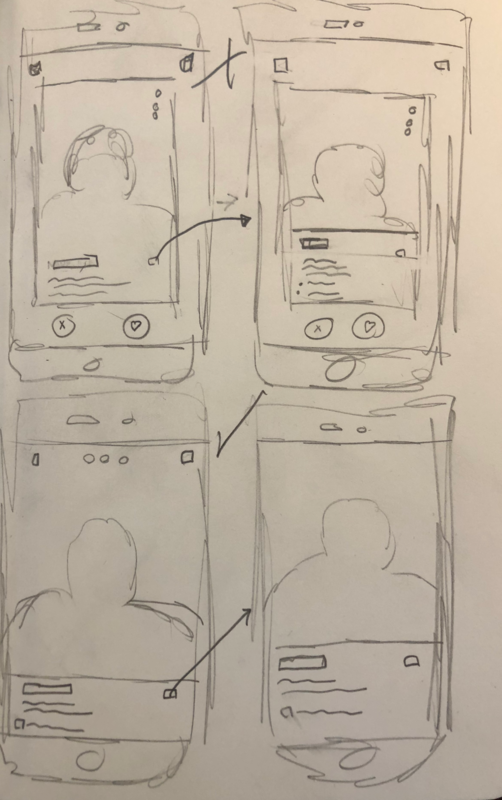 As a result, users repeatedly encounter profiles that aren’t an accurate depiction of what that person in the profile currently looks like, enjoys doing, or is even passionate about. Upon signing up, users are required to create a profile so that they can be matched with other users. However, because these dating apps solely rely on dating profiles to create matches, users are unconsciously encouraged to judge others exclusively by their profile. As a result, many users feel pressure to create a perfect profile, to tweak who they are so that their profile appeals to as many users as possible. Due to the inaccuracies in users’ Facebook profiles and the pressure that they face to maintain and create a flawless dating profile, users on dating apps often resemble a skewed version of who they are in real life. In other words, users are frequently presented with profiles that are either outdated or built from fabrications and exaggerations; they spend time swiping through a large pool profiles only to later realize on a date that the person they matched with is nothing like their profile and does not share the same interests, passions, and characteristics that made the user feel connected to them in the first place. Where you go and what you do at the places you go can say a lot about who you are as a person without you having to say anything. Your favorite and frequented locations can naturally define your persona to the people who get to know you and can suggest the types of people you would enjoy surrounding yourself with. Thus, in relying on location to match users rather than Facebook accounts or dating profiles, Serendipity mitigates the issues of misrepresentation and pressure. 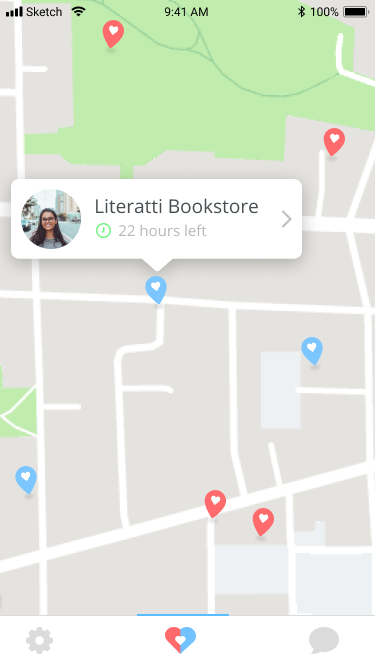 Specifically, Serendipity’s platform revolves around users pinning their favorite and frequented locations with drops for other users to stumble upon. 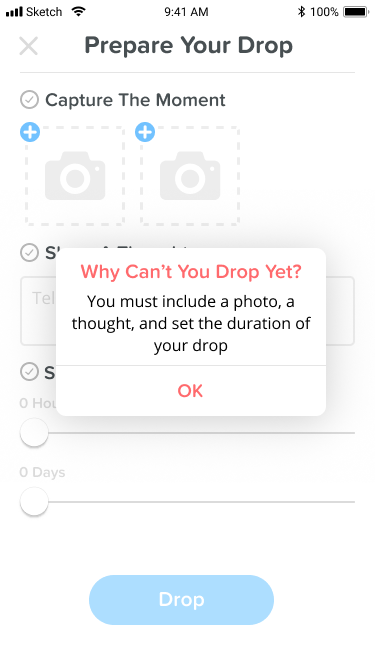 If a user discovers another user’s drop they can view a picture and note that capture how that user felt or what that user was doing when they created the drop. If a user is intrigued by a drop they’ve found, they can swipe right on it. 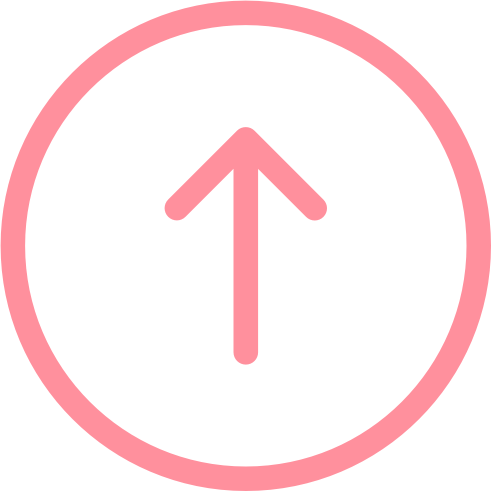 If a user swipes right on a drop, then the user whom it belongs to will be notified and be able to view the most recent drop of the user who swiped right on their drop. If both users swipe right on each other’s drops they will be matched and unlock the opportunity to message each other on the application. There is no algorithm or prediction based matching; you meet people in a serendipitous way. 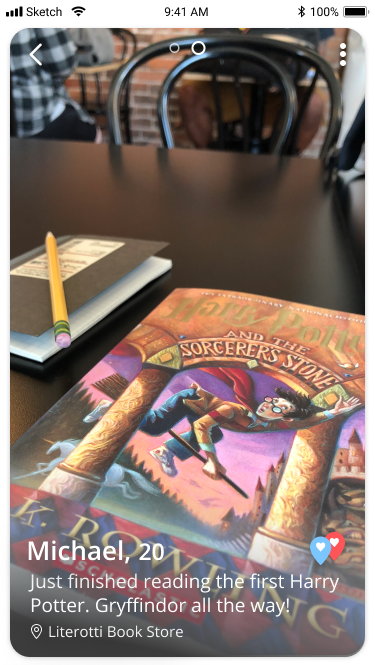 For instance, let's say I’m nestled in the upstairs coffee shop of Literati (my favorite book store) and have just finished reading Harry Potter and the Sorcerer's Stone for the first time. 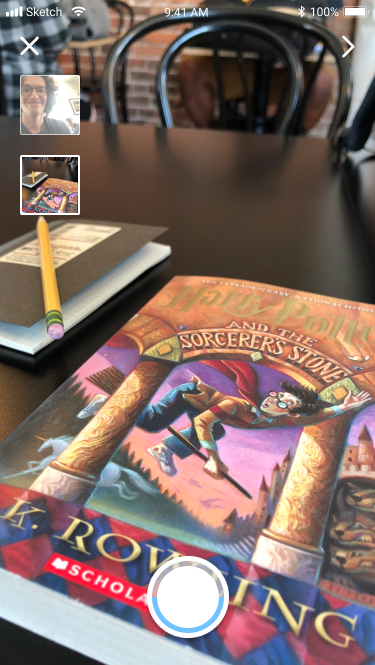 I decide to create a drop, so I select its duration, take a selfie of me holding the book, and then I add a note saying “Just finished reading the first Harry potter! Gryffindor all the way”. A few hours later someone picks up my drop and now has an idea of what kind of books I like. They’ve never read Harry Potter, but they’ve seen the movies and are definitely ready to debate that Gryffindor isn’t the best house. They’re not an avid reader, but they’ve read a fair amount of books and wonder if I’ve read any of the same ones; they’d love to talk about them! 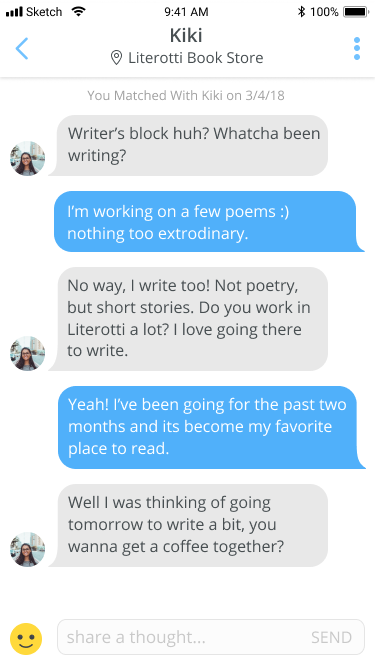 If we match, they think they might want to ask me to grab a coffee at Literati (it’s their favorite place to get coffee). On Serendipity, users aren’t only connecting with people who frequent or are interested in the same places as they are. Users are connecting with people who may also participate in the same activities within those locations or may have experiences or interesting stories from those locations that can spark conversation. 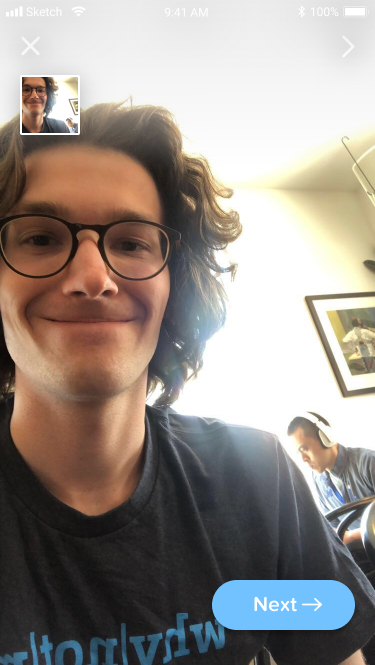 Having such connections with other users not only makes its less awkward to initially message them, but it also provides a foundation to build a genuine relationship. Additionally, because the places people go aren’t something that can be added into a profile but rather an intrinsic part of who they are, Serendipity’s location driven platform keeps users honest. A user cannot look on a map and create drops wherever they want or see where the drops are around them. In order to create or stumble across a drop in a location, users have to physically be in that location. This forces people to get out and be involved in their surroundings. 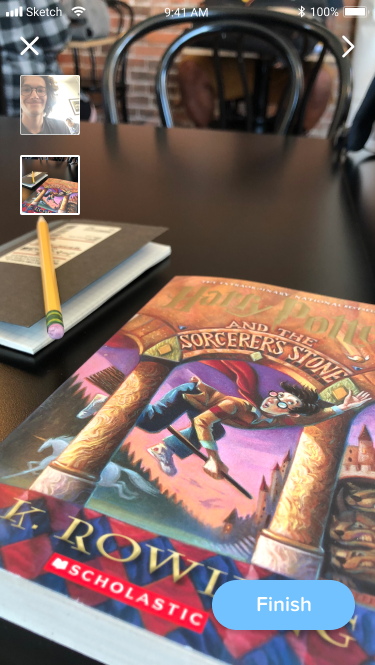 On Serendipity users can’t hide behind their phone screen, rather they’re encouraged to be in touch with the real world and be present in the places around them. Before I began sketching out my ideas for Serendipity I wanted to explore whether matching people solely by the locations they had in common would actually create genuine connections. 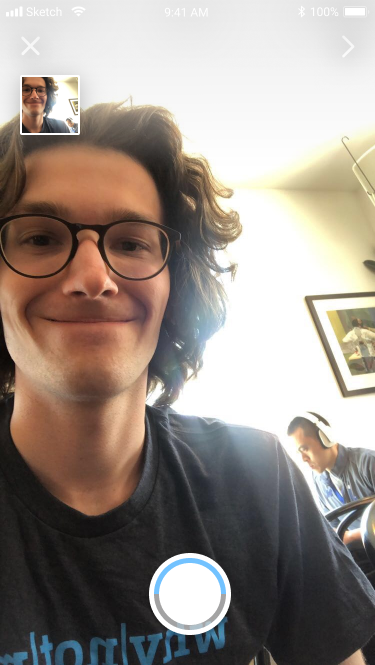 In my research, I matched University of Michigan students based on their shared locations and then gave them the opportunity to get coffee together. Specifically, I used a google form to get a list of each participant’s favorite and most frequented locations. I then matched participants who shared a location and scheduled those matches for a coffee chat. At the end of each coffee chat, I had the participants fill out another google form so that they could detail their experience and provide any thoughts or feedback. For every coffee chat, participants knew which location(s) they shared with their match but no other information about their match. 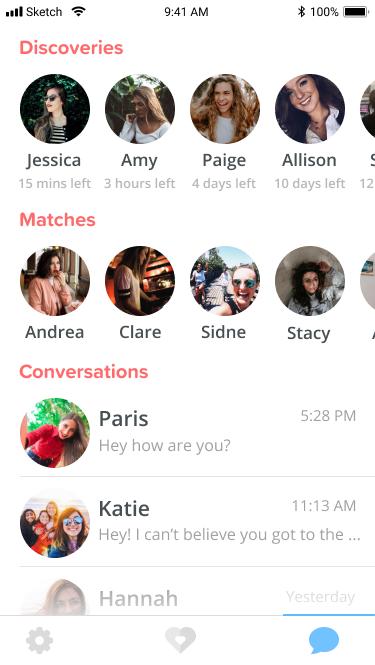 I intentionally made the coffee chats blind so that I could better understand what information and how much information Serendipity users would want to know about their match (i.e. what information should be included in a drop). The results of the coffee chats can be seen below. Did you find that you used your common locations as a conversation starter? Did you like that you were connected with someone based on a common shared location rather than common Facebook interests, mutual friends, etc? How did this experience compare to your other experiences using dating apps? "It seemed a lot less stessful than other dating apps"
After conducting coffee chats for nearly a month, the results revealed that location is a useful piece of information to match people and can help form genuine connections. Additionally, I was able to use the feedback to guide my design of the drop. Specifically I was able to use participants comments to determine what information would be included in a drop. A drop includes the first name and age of its creator, one front and one back camera photo taken by the user during their creation of the drop, a note written by the user, the location the drop was created in (i.e. 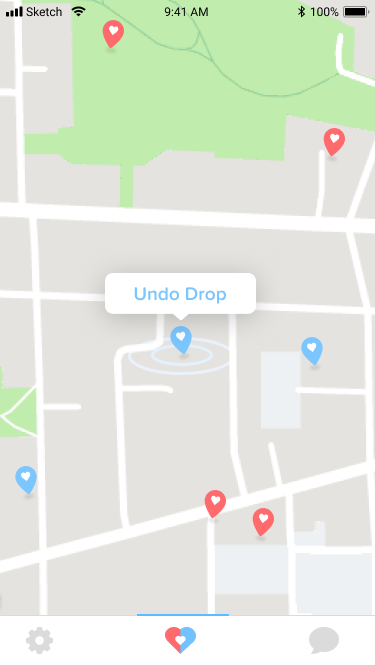 where it will also be found), and any additional locations that are shared between the user who created the drop and the user who found the drop. Even though I knew what information I wanted a drop to include, I first had to settle on how that information would be organized and represented in a drop. My initial ideas can be seen below. 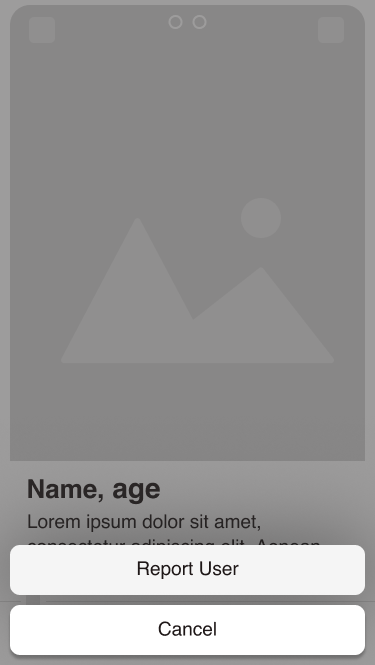 In a drop, if there any additional locations that are shared between the user who created the drop and the user who found the drop, the shared locations icon will be present on the right side of the screen next to the name and age. If the shared locations icon is present, then the bottom third of the screen can be clicked to reveal the additional shared locations. Users can exit the drop by clicking on the icon in the top left corner of the screen. Additionally, users can report a drop (i.e. report the user who created the drop), by clicking on the icon in the top right corner of the screen. Users can change which picture is in view by clicking on the right and left side of the screen. If they click on the right side of the screen the next picture in the drop will appear. If they click on the left side of the screen they previous picture in the drop will appear. 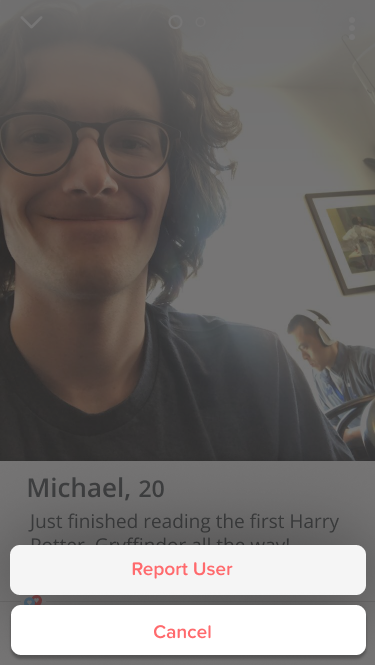 If a user is interested in the person presented in the drop, they can swipe right. While they’re swiping right a check mark icon will appear on the drop. 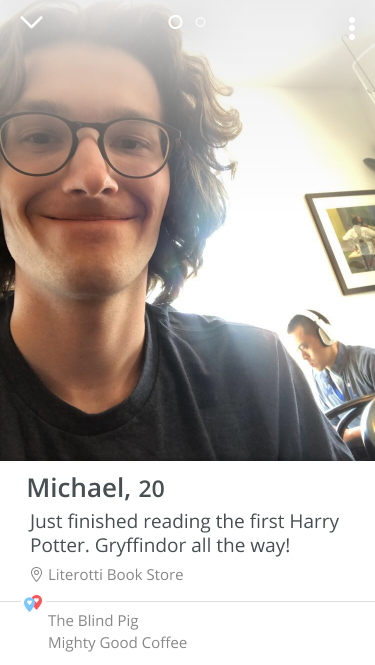 If they are not interested, they can swipe left.  While they’re swiping left an x mark icon will appear on the drop. After finishing the high fidelity drop designs I used Principle to see my designs in action. Below is a simple prototype demonstrating how a user might interact with a drop they discover. 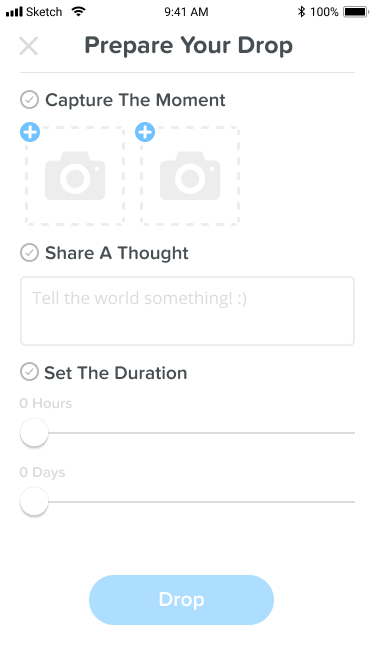 After I finished designing the drop, I proceeded to design the rest of the interface of the application. 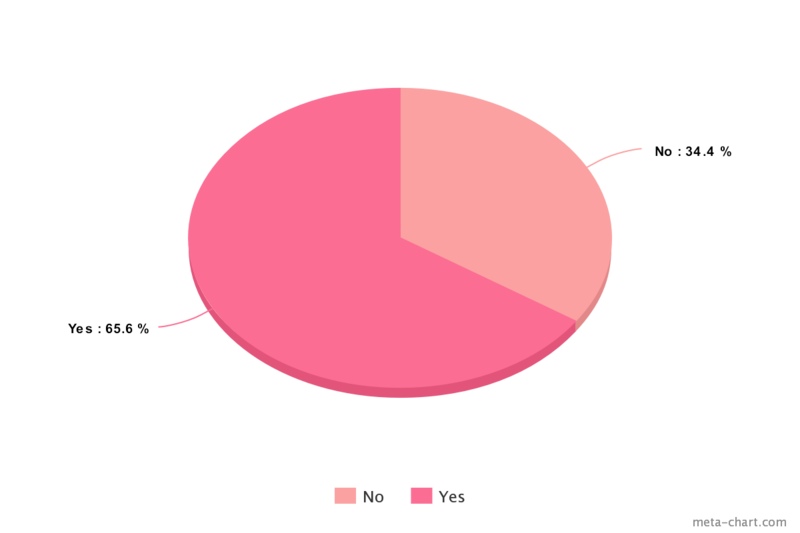 The final results can be seen below. The Exploration screen is divided up into three sections, Discoveries, Matches, and Conversations. The Discoveries section displays all of the drops a user has stumbled upon but has not yet swiped on. Each discovery (i.e. drop) displays the front camera picture it contains and the time left until it expires. 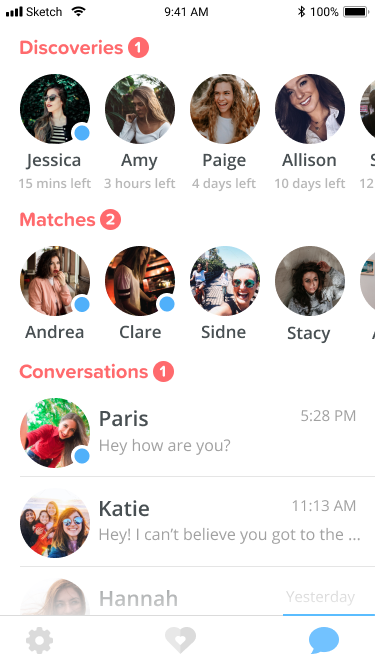 The Matches section displays users’ matches that have not yet been interacted with; clicking on a match will take users to a messaging screen where they can start up a conversation with the user they matched with. Once they begin conversing with a match the match will be moved to the Conversations section. 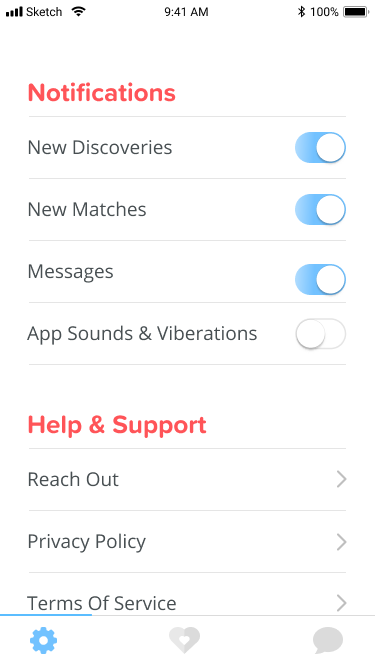 In other words, the Conversations section is where users communicate with their matches. In the Drops section, users set their preferences for the drops they discover and create. 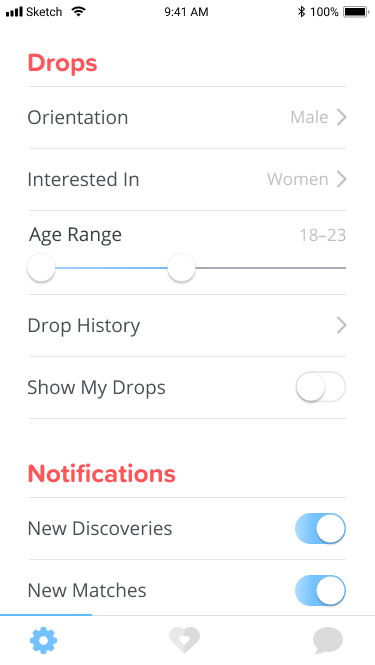 Before users can create or find drops, they must select their gender identity, select which gender identity(s) they are interested in matching with, and set their age preference. 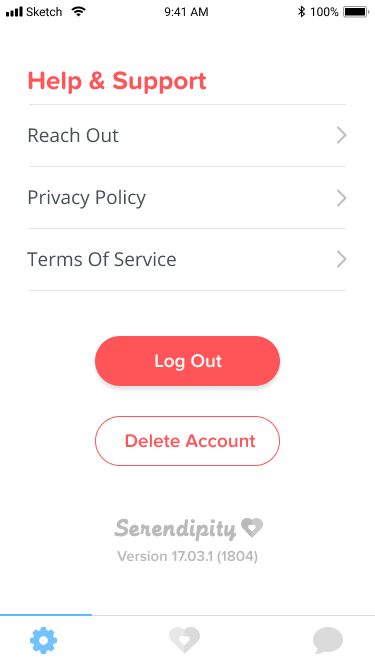 Users must fill out these preferences so that they don’t discover drops from users who they wouldn’t be interested in conversing with or having intimate relations with. Specifically, in selecting their gender identity a user will only discover drops created by users who are attracted to the gender that the user identifies with. Additionally, in selecting which gender identity(as) a user is interested in matching with, they will ensure that the creators of the drops they discover will also only be users who identify with a gender that the user is attracted to. 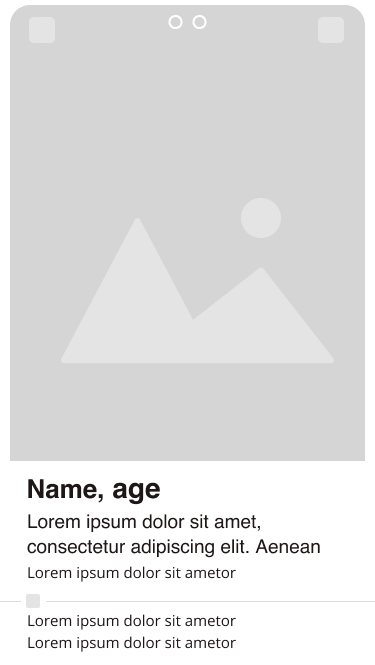 Moreover, in setting an age preference users will only discover drops created by users who fall within the age range set by the user. In the Drops section users can access their drop history. Specifically, they can view all of their past drops, both expired and active. 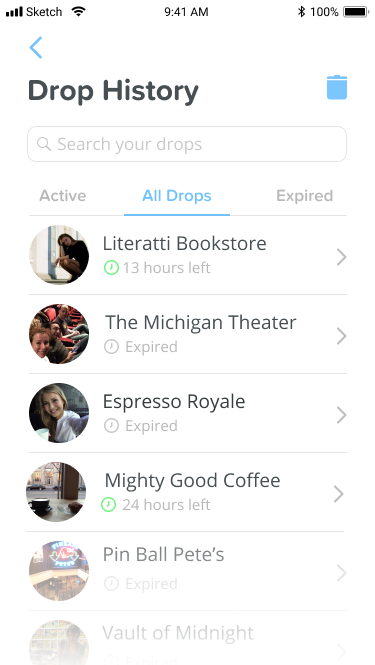 In viewing their active drops, users can see how much time each active drop has left until it expires. Additionally, users can delete their active drops so that they won't be discovered by other users anymore. Users can also use the Show my Drops toggle switch to turn their active drops on and off. In other words, they can control whether users can discover their drops. The notifications section allows users to set their preferences for alerts and app sounds. Specifically, users can choose whether to be notified when they have a new discovery (i.e. they stumbled upon a drop), they have a new match (i.e. 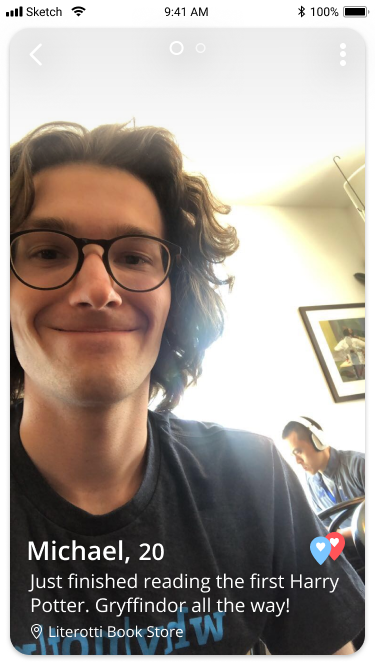 they swiped right on a drop and the user who created the drop swiped right on them back), they get a message from another user. Users can also view the drops they’ve created that are still active and the drops that they’ve discovered but not yet swiped on on the Main screen of the app. Each active drop that a user has created is represented by a blue pin angled slightly to the left. Each discovered drop that has not yet been swiped on is represented by a red pin angled slightly to the right. Each drop’s placement on the map corresponds to where it was created or found. 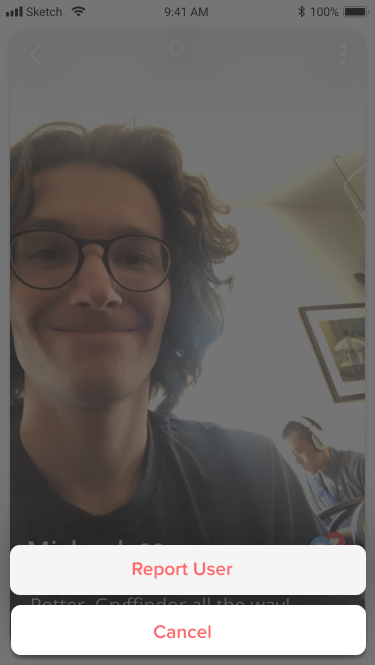 When a drop is force touched on, a preview pops up displaying its front camera photo, the place its located in, and the time left until it expires. 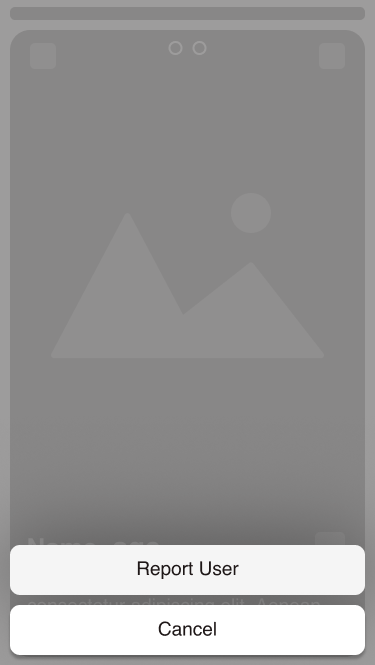 When a drop is just clicked on, users can view it in its entirety and swipe on it. If the heart icon in the bottom navigation is clicked, while on the Main screen of the application, the Prepare Your Drop screen will appear. 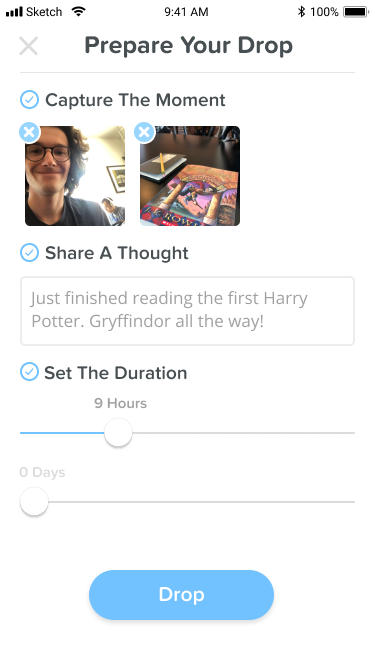 In no particular order users must take a front and a back camera photo, jot down a thought, and set a duration to create their drop; by default a user’s drop includes their name, their age, and the location their drop was created in. 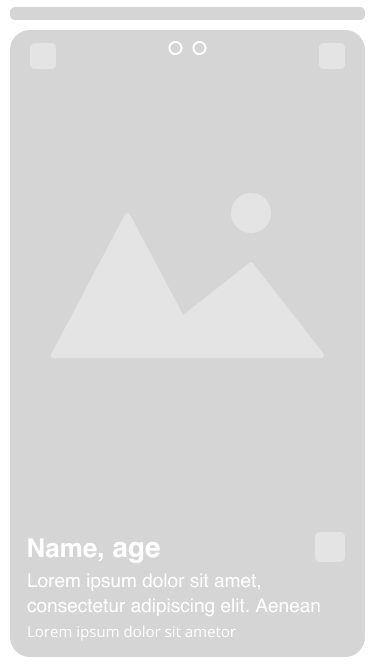 To take a photo, users will click on one of the camera containers. The left container will always display the front camera photo and the right container will always display the back camera photo. Immediately following the click of one of the containers, the Camera screen will appear and users can take their photo(s). After clicking the drop button, users will be taken back to the Main screen. For a few seconds an undo button will appear directly above their new drop. If clicked, the Prepare Your Drop screen will reappear and users will be able to edit their drop or undo its creation. Although Serendipity is still a work in progress, it has been a constant source of learning and has contributed greatly to my interest in design. 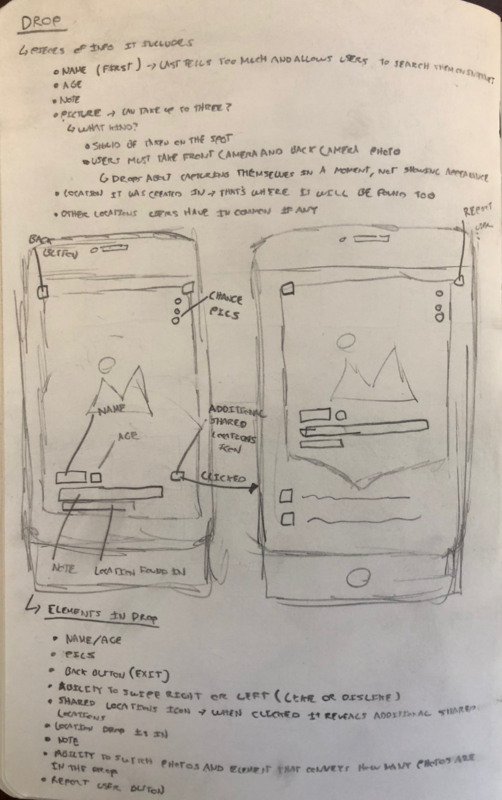 While I have accomplished and learned what I initially set out to in this passion project, I am interested in conducting a thorough user testing of my designs in the near future.